Posted on Sun, Mar 18, 2012 : 9:28 p.m. The Michigan football team, in need of depth at tight end, has added another body to the mix for next season. 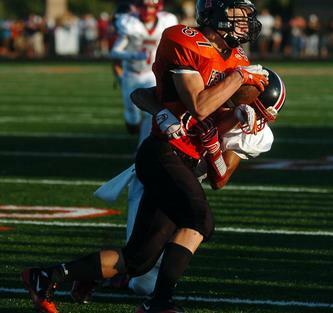 This one comes via the preferred walk-on route after Fenton High School's Quinton Mandle agreed to join the Wolverines on Saturday, according to high school teammate Tyler Tokarsky. Tokarsky, a long-snapper, also will be a preferred walk-on at Michigan next season, part of a three-man contingent to join the Wolverines from the rural town about 40 minutes north of Ann Arbor. Kenny Allen, a kicker/punter, is the third. Fenton High School tight end Quinton Mandle (87) will be a preferred walk-on at Michigan. A preferred walk-on is a player who is not offered a scholarship, but guaranteed a spot on the team in the fall. Mandle was offered his spot while attending Michigan's first practice of the spring this weekend. The 6-foot-5, 225-pounder didn't have any scholarship offers, but held some interest from Mid-American Conference and Ivy League schools, Tokarsky said. The Wolverines' depth was thin at tight end last season, since former coach Rich Rodriguez didn't feature them in his spread-option offense. Then, they lost their top two tight ends to graduation in Kevin Koger and Steve Watson, and also dropped recruit Pharaoh Brown from the 2012 class. That leaves a shortage of players at the position as the Wolverines transition to coordinator Al Borges' West Coast offense. They added two for next season in incoming freshmen Devin Funchess and A.J. Williams, and coach Brady Hoke told AnnArbor.com last week that linebacker Jordan Paskorz and defensive end Chris Eddins also are moving to the position. That means Michigan will have at least five new players at tight end next year. Mon, Mar 19, 2012 : 8:27 a.m.
Mon, Mar 19, 2012 : 7:44 a.m. This kid's film looks great. He is a fluid athlete and has a similar style to Rob Gronkowski. It is surprising that he had no other offers. Mon, Mar 19, 2012 : 4:16 a.m.
Mon, Mar 19, 2012 : 3:29 a.m. I love it when kids, not highly looked upon get an opportunity to perform. This kid will work hard and have a chance to make the team and then earn his scholarship. Welcome to the Michigan family. Mon, Mar 19, 2012 : 2:36 a.m.
big kid, cathes the ball well in traffic and has a nack to get open. . . how about those 1-handed catches. welcome to MICHIGAN QUINTON MANDLE!! GO BLUE!!!!! !